Goldman Sachs | Commodify Me! My report will provide a detailed analyse of speculation on the commodities market during the past couple of years. It will analyse what speculation is, how it has distorted markets and affected prices of such commodities, the impact it is having upon buyers, sellers and consumers, who has profited from this type of investment and background what politicians and lawmakers are doing to combat it. WHAT IS SPECULATION AND HOW DOES IT WORK? According to Investopedia, Speculation is defined as “the process of selecting investments with higher risk in order to profit from an anticipated price movement”. CLICK HERE to read more. The Seattle Times, using oil as an example, provides a nice summary of how speculation works. CLICK HERE to read. Investopedia also has an article which defines the role of a speculator. CLICK HERE to read more. HOW SPECULATION HAS AFFECTED THE MARKET? There is a general consensus amongst politicians and those participants in the market that speculative investment has played a major role in distorting prices of commodities over the past couple of years. 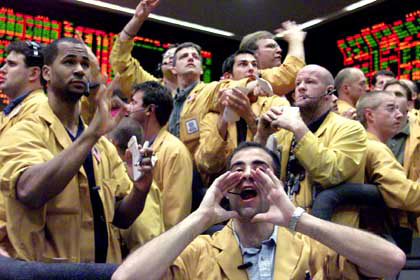 Perhaps the best example of commodity market speculation occurred during mid-2007 and the summer of 2008 when the price of oil rose from US$60 a barrel to an all-time high of $147. CLICK HERE to read a transcript of 60 Minutes investigation. Wheat was another commodity that was heavily speculated upon, according to a story by Reuters. A year-long Senate probe found “substantial and persuasive evidence” that non-commercial traders pushed up futures prices, disrupted convergence between futures and cash prices and increased costs for farmers, the grain industry and consumers. The price of wheat soared to a high of US$13.34 a bushel after commodity index traders snapped up more than 200,000 wheat contracts by mid-2008 on the Chicago Mercantile Exchange. The Senate study found index traders increased their holdings from about 30,000 daily wheat contracts in 2004 to 220,000 contacts in mid-2008. CLICK HERE to read more. The Financial Times aluminium – despite a “gravity-defying recovery in the face of falling demand and a growing supply surplus” – rose 30% this year on the back of speculators buying up the commodity and storing it in warehouses to create a fear that supply was running low, hence pushing prices upwards. CLICK HERE to read more. Matt Taibbi from RollingStone magazine predicted that carbon credits could be the next commodity to boom on the back of speculative investment. Like commodities, carbon credits will be traded on futures markets, meaning could mean similar scenario to oil, wheat and aluminium prices is likely. It all hinges what happens in Copenhagen. CLICK HERE to read more. The Guardian also reported that those suffering from malnutrition rose from about 800 million to more than 1 billion due to speculation on the world food market, with pasta protests in Italy, tortilla rallies in Mexico and onion demonstrations in India. Joachim von Braun, the head of the International Food Policy Research Institute told the British newspaper that “food market remains seriously exposed to short-term flows of indexed funds into commodity exchanges” and that speculation was, among other factors, were contributing to higher prices. “What we didn’t foresee two years ago is how speculation exacerbated the real market issues. It was not a primary cause but a second-round amplifier, which added seriously to the problem,” he said. CLICK HERE to read more. Speculation also makes it difficult for buyers and sellers to hedge. (CLICK HERE to see the difference between hedging and speculation). During the first hearing held by the Commodity Futures Trading Commission (see WHAT IS BEING DONE TO CURB EXCESSIVE SPECULATION? ), the New York Times reported that senior vice president of Delta Airlines, Ben Hirst, said speculative investment in oil had added US$8.4 billion to his company’s bill. Around $1.7 billion had come from hedging against price increases. CLICK HERE to read more. New Zealand has also been impacted by speculation, though of a different variety. In a column called ‘The Las Vegas of the currency world’, financial guru Brian Gaynor wrote in the NZ Herald that the New Zealand Dollar was one of the most heavily speculated currencies in the world. CLICK HERE to read more. While this may seem off topic, it must be noted that specualtion on the dollar has had a huge impact on New Zealand commodities like the diary industry. In October, The National Business Review reported that diary giant Fonterra milk powder prices on its online auction rose 5.7% from the previous month, but most of that gain had been wiped out by the high Kiwi dollar. CLICK HERE to read more. The Otago Daily Times also had a similar story which looked it how speculation on the dollar impacted Meat company Alliance Group. CLICK HERE to read more. WHO HAS BENEFITED FROM SPECULATION? Among those who have made some serious coin from excessive speculation is American investment banks Morgan Stanley and Goldman Sachs. In fact, they’ve made so much moolah from the 2007/08 oil market bubble, they’re swimming in a safe full of money much like Scrooge McDuck! According to a story by Reuters, non-commercial investors accounted for 71% of oil contracts bought on the world’s largest energy trading market, the New York Mercantile Exchange, as of April 2008 – over twice what it was eight years ago. Moreover, fewer than one in every 10 barrels traded is delivered to customers. CLICK HERE to read more. Matt Taibbi wrote a scathing analytical piece for RollingStone magazine about how Goldman had orchestrated every market manipulation since the 1929 Great Depression. His story gives an insight into the role Goldman played in the speculation of black gold. “In the six months before prices spiked, according to the U.S. Energy Information Administration, the world oil supply rose from 85.24 million barrels a day to 85.72 million. Over the same period, world oil demand dropped from 86.82 million barrels a day to 86.07 million. Not only was the short-term supply of oil rising, the demand for it was falling — which, in classic economic terms, should have brought prices at the pump down,” Taibbi wrote. “Between 2003 and 2008, the amount of speculative money in commodities grew from $13 billion to $317 billion, an increase of 2,300 percent. By 2008, a barrel of oil was traded 27 times, on average, before it was actually delivered and consumed.” CLICK HERE to read more. Equally scathing of Goldman’s and its speculative activities was Raymond J Learsy. The author of ‘Over a Barrel: Breaking Oil’s Grip on Our Future’ highlighted, among other things, how Goldman and Morgan Stanley how the investment banks turned themselves into bank holding companies following the financial meltdwon in the U.S. so they could access the TARP Fund and other taxpayer bailout money from the Federal Reserve Bank and Treasury to speculate heavily in oil markets instead of lending to businesses and financing mortgages, which the money was intended for. “Both banks reported enormous gains from their trading activity over this second quarter, enough for Goldman, according to the WSJ (“Big Pay Packages Return to Wall Street” O7.02.09) to be on track to pay out $20 billion this year or $700,000 per employee nearly double the firm’s $363,000 average last year!” he wrote. Learsy also questions how the banks keep the prices of oil artifically inflated: “They are chartering supertankers for months to a year at a time, loading them with hundreds of millions of barrels of crude oil and oil products, taking the oil and oil products off the market thus helping to sustain and propagate ever higher oil prices at vast additional cost and burden to the nation’s consumers. The oil is held at sea for months, thereby tying up hundreds of millions of dollars, in anticipation of yet higher prices for the oil/oil products cargo at the end of the tanker charter period.” CLICK HERE to read more. WHAT IS BEING DONE TO CURB EXCESSIVE SPECULATION? After the prices of oil and wheat skyrocketed to record highs, there was a general concencuss among world leaders, politicians and lawmakers that steps needed to be taken to curb excessive speculation. They admitted as much during this year’s G8 meeting in Italy. CLICK HERE to read more. In July 2009, the Washington Post reported the chairperson of the Communities Futures Trading Commission (CFTC), Gary Gensler, floated measures to reduce the volatility in commodity prices and ensure did not monopolise the market. The announcement came as a somewhat of a surprise to those on Wall Street given the CFTC had a history of having a rather hands-off approach toward market regulation during the last two decades. But moves by the CFTC are part U.S. President Barack Obama’s efforts to overhaul the regulatory regime after critics said its laxity contributed to the global financial meltdown over the past several months. Gensler’s suggestions included setting position limits on an investment any single firm could make in a particular commodity and requiring more public disclosure about the holdings of commodities traders. Hearings would be held to gauge people’s thoughts on the proposed changes, he said. CLICK HERE to read more. Reuters reported the CFTC was hopeful regulation would be in place by late October. It must be noted, however, that Mr Gensler, who is an ex Goldmanite, seems like a strange choice to be pushing for tighter market regulation given his reluctance towards it in the past. According to a story in the Los Angeles Times, questions were asked about whether he was suited for the job after being part of the team that exempted derivatives from regulation when he was a member of the Clinton Administration. CLICK HERE to read more. USAToday details Gensler’s time at Goldman and in the Clinton Administration. CLICK HERE to read more. Not surprisingly, big market players like Goldman Sachs were critical about the CFTC’s proposals to tighten up markets which they had heavily profited from. Goldman Sachs chief financial officer David Viniar told the Reuters the bank’s energy trading was hedging and should be exempt from the proposed legislation. “Consumers need hedging. Producers need hedging. And you need financial intermediaries to help do that,” he said. CLICK HERE to read more. Ari J. Officer of Time Magazine argued there needed to be more oil speculators not less. CLICK HERE to read. Others like former Chief Investment Strategist and Head of the Investment Strategy Group at Merrill Lynch, Richard Bernstein, believes it was hedge funds and excessive lending from banks – not tradional speculators – which fuelled the speculative bubble in the oil market in 2007/08. Plans by the CFTC to regulate speculation would merely push speculators to the non-regulated over-the-counter markets, he wrote in a column on the businessinsider.com website. CLICK HERE to read more. In August, the Washington Post reported Gensler was also calling for tougher measures to be taken on derivatives after he felt proposed measures would leave parts of the derivatives market out of the reach of regulators and undermine efforts to combat fraud. He wanted derivatives to be subjected to mandatory clearing through clearing houses. CLICK HERE to read more. Alibaba.com reported on November 20 that regulations may not be as tough as first proposed, as there are fears that they could drive investors overseas markets, too, where regulation is not as stringent. That would rob the U.S. economy of a river of investment. It also appeared the CFTC was divided on the proposed measures, which included applying speculative limits on spot market and expiring contracts, but for all months and all monthly contracts combined. It also proposed applying limits to all traders except those those that intend to take physical delivery of the product, or legitimate hedgers. CLICK HERE to read more. A nice and simple breakdown of the propsed legislations can be found HERE. The evidence I have provided clearly shows that speculative investment has distorted the commodity market to a huge degree and has had a major impact on legitimate buyers and sellers when hedging and consumers. One only has to look at the highs oil reached, despite an increase in supply and decrease in demand, or wheat which also skyrocketed to record highs. Some, however, will argue that it is not legitimate speculators per se that have caused these distortions and, of course, they are right – but only to a degree. For it is speculative investment made by those types of massive hedge and pensions funds held by the likes of Goldman and Morgan Stanley – which, it must be reiterated, have made a truckload of dosh from this type of trading – who have done the most damage. While I applaud efforts from the CFTC, in particular Gary Gensler, who has pushed hard for tighter controls, to do something to combat the problem, I am inclined to agree with the skeptics somewhat. They are right when they argue that regulating trading of certain commodities will merely push investors into other unregulated or overseas markets. If politicians and lawmakers are serious about curbing speculation and other market manipulation, they must consider universal and wide-ranging controls across all exchanges. Only then can we curb excessive speculation. Commodify Me! has been busy with the daily grind of life and would like to apologise for not posting this sooner. Anyway, as we all know, the Commodities Futures Trading Commission held the first of its three hearings last week looking at ways to curb excessive speculation in oil, gas and other engery markets. The country’s top regulator of commodity markets said Tuesday that the government should “seriously consider” strict limits on the trades of purely financial investors in the futures markets for oil, natural gas and other energy products. READ HERE. Commodity Futures Trading Commission Chairman Gary Gensler sounded even more convinced Wednesday that trading limits must be imposed on speculative energy traders, and he found support from two of the biggest financial players in commodities markets.”No longer must we debate the issue of whether or not to set position limits,” Gensler said during the second day of CFTC hearings on excessive speculation in the energy markets. He added that the only remaining questions are how to go about it. READ MORE. JPMorgan Chase & Co. (JPM) came out in favor of position limits both on and off exchanges in a hearing before the Commodity Futures Trading Commission on Wednesday.But the bank wants exemptions maintained for swap dealers that help commodity end users buy and sell derivatives to reduce their exposure to price fluctuations. JPMorgan’s views closely matched those of Goldman Sachs Group Inc. (GS), which also had a representative at the hearing. READ MORE. You might also like to read the Seattle Times and the Houston Chronicle. Reuters have obtained statistics from the Commodity Futures Trading Commission (CFTC) which shows that speculators accounted for 71% of the benchmark oil contracts on the New York Mercantile Exchange (NYMEX), the world’s largest for energy trading, as of April 2008. Fewer than one out of every 10 barrels of oil traded on U.S. futures exchanges gets delivered to consumers, an equation that may change under sweeping new restrictions being weighed by the government’s top commodities regulator. Raymond J. Learsy, scholar and author of the Over a Barrel: Breaking Oil’s Grip on Our Future, has written an interesting piece in the Huffington Post that’s worth a read. Here we go again. The same Financial Class that brought us to the edge of economic meltdown is now pressing its well connected pals and cronies on Wall Street, in Congress as well as its allies in the press and our OPEC cheering oil industry, to lay hands off the continued stripping America’s wealth through the gamed racket and egregiously profitable world of oil futures trading. This week the Commodity Futures Exchange Commission (CFTC), responding to a national and international outcry that enough is enough, and in keeping with the Obama administration’s goal of tougher oversight, has finally decided to act. Reacting to Congressional pressures, a struggling industrial landscape and a beleaguered public, the CFTC announced that a series of restrictions on energy trading would be set forth. And here the CFTC and the American public’s outrage is not alone. Earlier this week the Wall Street Journal printed an Op-ed Essay (July 8,2009) jointly written by Prime Minister Gordon Brown of Great Britain and President Nicolas Sarkozy of France calling for “transparency and supervision of the oil futures market in order to reduce damaging speculation” (The WSJ, signaling its take on the issue placed the piece at the bottom of its pg.15 Opinion column). READ HERE.